March is Workplace Eye Safety Month and our doctors at Grin Eye Care want to remind all of you to keep your eyes safe and healthy during your work day. Check out these important safety tips! KNOW YOUR SURROUNDINGS:If you are working around dust, chemicals or any type of radiation (welding, lasers etc) be sure you are aware of the potential eye hazards around you. Make sure tools work properly, areas are clean and protection is in good working condition. CHOOSE THE RIGHT EYE PROTECTION: If you are working in an area that has the potential for flying objects, dust or other small particles you should wear safety glasses with side protection. If you are working with chemicals, goggles are the best choice. If you are working around radiation (welding, lasers, fiber optics etc), you should be using safety glasses/face shields that are designed specifically for the task you are doing. PLAN FOR AN EMERGENCY: Be sure to have eye wash readily available in case an emergency occurs. You should also keep contact information for our office in an accessible location in case you need to contact us for medical care. AVOID DISTRACTIONS: When you are working with anything that could potentially harm your eyes, resist the temptation to multi-task. 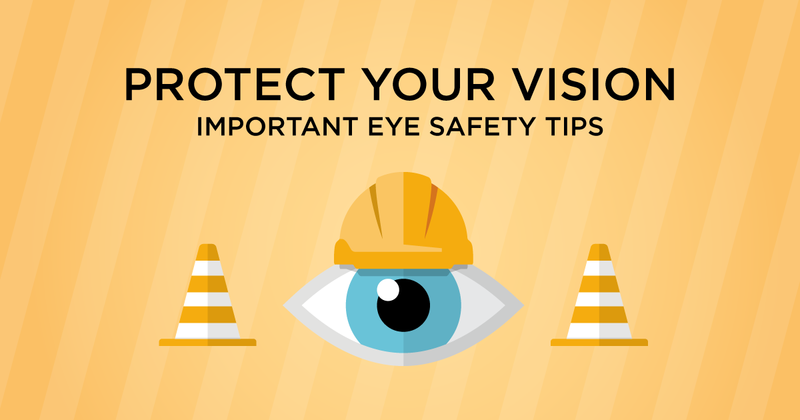 2.4 million workplace eye injuries occur in the United States each year. Don't let yourself be part of that statistic! SCHEDULE YOUR ANNUAL EYE EXAM: In order to avoid accidents, be sure your vision is corrected to the maximum potential and your eyes are healthy. Our experienced doctors will be happy to see you for your comprehensive eye exam at any of our three offices (Olathe, Leawood and Grandview). Our certified opticians can also help you choose the most appropriate safety eye wear for your specific work requirements. Call us today! !